Dyna Glo Smart Space Living 3 Burner Gas Grill Review – Is It A Top, Low Cost Grilling Option? The Dyna Glo Smart Space Living 3 Burner Gas Grill with the Dyna Power cooking system offers quality, performance, and versatility. With 503sq inches of total cooking space and 30,000 total BTU’s of heating power, this space-saving grill is a perfect family grill. The unique cooking system is surrounded by a double-walled fire box. It features three high-performance stainless steel burners that produce 36,000 total BTU’s of heating power. Three heavy gauge enameled steel heat tents are there to deflect heat evenly across the cooking surface and protect the burners. These tents prolong the life of your burners as well as vaporize falling juices, creating flavorful smoke that provides your food with that great BBQ taste. These features work together to quickly pre-heat the grill and retain the ideal temperatures during the entire cooking process. The cooking grates are made from cast iron and coated with a high gloss, porcelain enamel finish. Cast Iron is ideal for retaining heat while the enamel surface is ideal for transferring the heat directly to the food for searing and locking in natural juices. That’s where the flavor is folks! The Dyna Glo Smart Space Living 3 Burner Gas Grill is another budget friendly LP gas grill that made my list of best low-cost propane gas grills of 2017. Is the Dyna Glo Smart Space Living 3 Burner Gas Grill A Quality Grill? 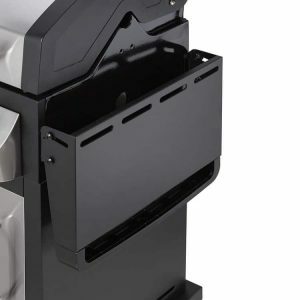 At first glance, the Dyna-Glo Smart Space Living 36,000 BTU 3-Burner LP Gas Grill looks like an expensive grill. This is because of the fact it looks modern. By the second look, you realize it is affordable. The reality is it is one of the best and most affordable little grills on the market today. Dyna Glo is a brand that has gained a reputation for building excellent grilling systems that are high in quality and a great value for the money when compared to other big named brands on the market. The Dyna Glo Smart Space Living 3 Burner Gas Grill is no exception and is an excellent example of a design offering top value. Let’s face it, most people decide on a gas grill because of its convenience. You push a button, turn a dial and you can be cooking in minutes. But whether the grill performs up to standards is another matter. The bottom line here is if you really want to get the most out of your backyard cooking while working on a budget, you need to turn to a reliable brand that has proven themselves. 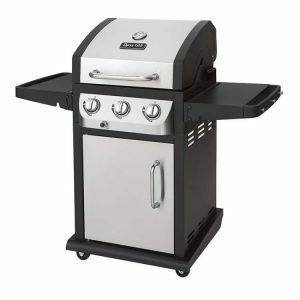 A grill that is responsive, well designed and durably built. I believe the Dyna Glo Smart Space Living 3 Burner Gas Grill can be the answer. The Dyna Glo Smart Space Living 3 Burner Gas Grill is a freestanding gas grill weighing in at 76lbs, standing 45 inches tall, 23 inches deep and 43 inches wide. It offers 386 square inches of main cooking area to go with a warming area of 117 square inches. It is the perfect size for small patios and is lightweight enough that you could easily move it to another location for grilling. The stainless steel lid assembly offers a double walled liner for retaining the maximum amount of heat along with cast aluminum caps for stability. 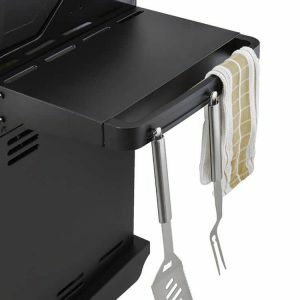 This grill is made for ease of use with an easy lift, wide grip handle. 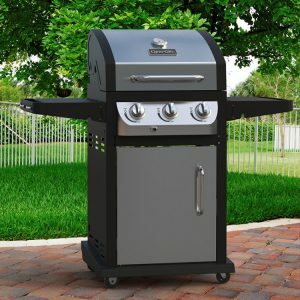 A push button, Dyna-Pulse electronic ignition system and a closed cabinet with stainless steel double walled doors are also great features you will find on this grill. There is ample space for storing a propane tank and multiple BBQ accessories in the closed cabinet. There are four heavy-duty caster wheels for easy movement including two locking casters to keep the grill in place while cooking. In addition to being easy to use, this grill is also stylish. It comes with a brass, stainless steel finish and a decorative easy to read temperature gauge with stainless steel bezels. There are three stylish decretive knobs on the control panel to customize the heating temperature for your specific needs. Two side shelves offer space for food preparations and the integrated towel bars and tool hooks make hanging your equipment a cinch. Plus, the shelves easily fold down for space saving storage. Take your grilling to the next level with the Dyna Glo premium gas grill. This entry from Dyna Glo has basic features, lacking any big extras such as a side burner. Although this grill does a good job of retaining heat well overall, there are some noticeable hot and cold spots on it while cooking. You may have to be aware of the things you are grilling to avoid overcooking. This is pretty common for grills in this price range. With that being said, a lot of attention is paid to details on this grill. From the nicely responsive controllers and valves to the push button electronic ignition, most things are done well with this product. The bottomless body design works great for cleaning the heat tents and grates. The drip pan collects all the greasy leftovers. Simply slide the pan out to clean out the leftovers and you are done. Regardless of the price range, you fall under, the internal temperature gauge thermometers built into the hoods are mostly low quality and inaccurate. They are routinely off by as much as 50°F. That is why I always recommend a good digital meat thermometer that includes a probe that can be placed on the cooking surface for accurate temperature readings. Overall, it delivers a solid performance even with its compact size. The Dyna Glo Smart Space Living 3 Burner Gas Grill has received many positive comments from its owners at Amazon.com. It is currently rated 4.1 out of 5 stars. In all fairness, its owners have also voiced some negative reviews. One of the most common complaints about this gas grill is on its uneven heat distribution. According to some owners, the temperature in the front is lower than the temperature in the back. This means being prepared to monitor and rotate your meat when needed. I have also seen complaints about internal components like the grease pan and heat shield rusting after two years of use. There is a reason grills in this price range are considered “disposable” grills. You can certainly squeeze a few more years out of this grill with attention to maintenance and a little TLC. Keeping it clean and properly covered always go a long way in prolonging the life of any grill. According to a lot of feedback from people who have used this grill for several years, the burners are great and can withstand almost any types of use. The manufacturer claims they are 40% more durable than other brands burners, and this looks to be true. Like most gas grills in this price range, the Dyna Glo Smart Space Living 3 Burner Gas Grill is far from flawless. With that being said, it seems that a high majority of its owners are satisfied with their purchase. The simple overall design is durable, easy to use and quick to clean. The small size is a great space saver and makes it easy to store. Finding an inexpensive grill that cooks well and will last for a few seasons is not easy. It is important to remember this when looking at grills in this low-cost price range. Whether you are buying a grill to fit a smaller backyard footprint or simply need to cook for a handful of people, you still deserve the quality and performance you have come to expect from large grills found at BBQ stores! If you are in the market for something that will last you for a decade or so, then this grill is probably not the right one for you. 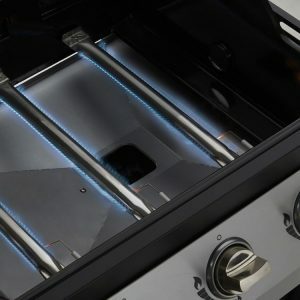 But if all you need is an inexpensive LP gas grill that is compact, durably made, retains heat and cooks well, then this Dyna Glo Smart Space Living 3 Burner Gas Grill is definitely worth looking into. The 386 square inch primary cooking area is the perfect size! It is large enough to accommodate grilling needed for a handful of people but small enough to offer excellent fuel and space efficiency! 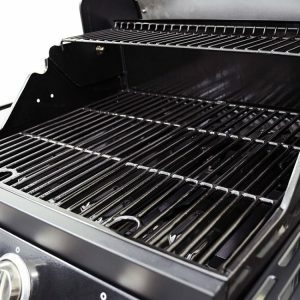 This grill serves as a solid choice for consumers as it offers strong heating power, is fairly easy to install, has good capacity and sports a solid build. This grill is a combination of performance and quality that works well in a small space design. In my opinion, this product is above average for a gas grill in this price range in the areas where it counts the most. Overall, a good combination of value, durability, features and size. if you or someone you know is in the market for a new LP gas grill or you find this information useful, please consider sharing it with your grilling friends or on social media! If you would like to leave a comment or have a review of your own to share on the Dyna Glo Smart Space Living 3 Burner Gas Grill, please do so below. We always welcome your input. *This rating is based on comparable gas grills in the low-cost price range. This rating is not meant to be compared to mid range or higher gas grills.